Pip Wilson bhp: I weep with people in object poverty. 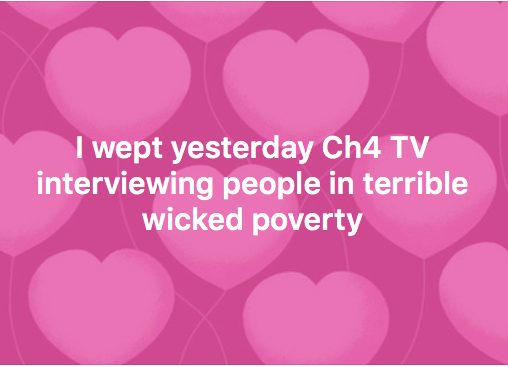 Interviewing people living in continuous poverty. The were in the Notth East of England. humans surviving is UK-wide in pockets of deprivation. I want to weep for them. I want to feel their hurt & neglect by us collectively. It's not just food money employment. People need support to help whole families to help get them to a place where they can stand on their own feet.